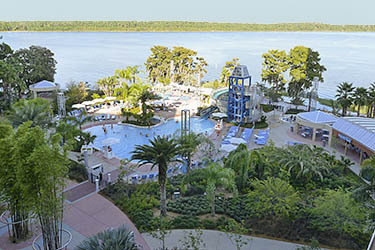 Disney World Bay Lake Tower hotel has a pool and a pretty garden. 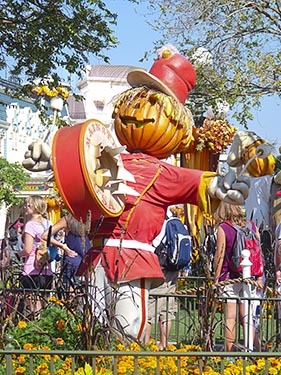 Parade at the Magical Kingdom - scarecrow and yellow fall flowers. Disney World has so many flowers. In October my mom took my sister Rachel and I to Disney World for the first time. We were so excited! As soon as we got off the plane we saw sooooo many palm trees. I asked my mom if Rachel and I could drink out of a real coconut! We saw lots of pretty flowers and trees on our trip. We went to Minnie Mouses's House. Almost everything there was pink but some things were purple. We went into Minnie's backyard and she had a beautiful gazebo. 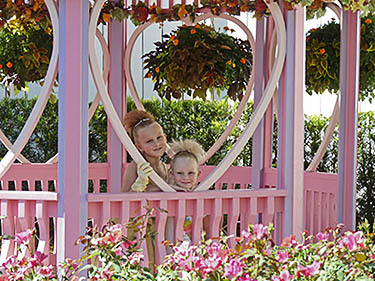 We went inside the gazebo and looked at all her pretty flowers. There were lots of birds there. She had pink and purple flowers everywhere. Some were hanging in baskets and some were on the ground. The flowers made us feel happy. The next picture we took from our balcony at the Bay Lake Tower. It shows our pool. It was so big. It had lights for the night time and a big waterslide with Mickey Mouse ears at the top. All around the pool were daisies, roses lots and lots of palm trees. We had so much fun at our hotel. We saw pretty fireworks over the lake. They put flowers in our room every day. Rachel and I got to have our own TV and could see the pool and palm trees from our room. The next picture was from the parade route at the Magic Kingdom. It was Halloween when we went so we got to go trick or treating and watch a show from the restaurant where we ate dinner. There were lots of flowers and decorations for Halloween. We really liked this scarecrow. His head was a pumpkin! There were lots of characters there wearing costumes. We saw lots of pumpkins, corn stalks , hay bales and bright coloured FLOWERS everywhere. It made us feel like it was Halloween even though it was so hot outside. We also got lots of candy!! We had a fun trip and we really liked looking at all the different kinds of plants and flowers they had at Disney World. We can't wait to go back. Maybe we'll send in some pictures from our next trip...to Boston! Glenys' Reply - Hi Isabelle. Thanks for the great story! I know you worked hard on that one. I'd love to take my cameras to Disney World and see all the great flowers and gardens AND all the Disney characters. You and Rachel look very pretty in Minni's gazebo and the scarecrow is a really handsome guy, too. Halloween was an excellent time to go. If you're going to Boston, make sure you take your camera and send me some pictures! I really liked Boston when I visited -you'll have a wonderful time. Hi Isabelle, Wow, your trip sounds wonderful. I really love your gazebo picture, especially the colours. I hope your trip to Boston is as much fun, and that you have some more great pictures to share!